Every year, the hack-a-thon at iPhoneDevCamp is a superb example of collaboration, team effort and hacking code. Chris Allen has been a fantastic mentor for many participants hacking code at the DevCamp and this camp was no exception. This time around, a couple of days of huddling and coding produced some amazing results – 44 iPhone applications based on big ideas and small ideas from open source dev tools to games and social apps. The hack-a-thon brought together teams of people who had never met each other before the conference started. Two days of intense collaboration, communication and coding (sounds like open source doesn’t it!) culminated in demos of these applications that were judged by a panel of experts for categories of best 90 minute app, best open source app, coolest app, most useful app, best developer tool, most educational app, best social app, best game, best web app. Our team of five worked on developing a multiplayer version of “Rock, Scissors, Paper” and appropriately named it RSPRoyale. Our team gave a good demo. We plan to work further on the app and hopefully make it available through the iTunes AppStore. The unconference happening simultaneously had a lot of interesting talks as well. By the evening, once the demos were conducted, the best apps in each contest category were announced and awarded some cool prizes – an iPhone 3G, a 17-inch MacBook Pro, JBL speakers, VMWare Fusion, Adobe Dreamweaver CS3, Apple Store gift certificates. A group photo of the DevCamp community with the satellite groups visible online on the background screens was one of the highlights of the whole event. I congratulate the organizers (Raven, Dom, Chris, Blake) who put this camp together and the community. It was a great experience of team building, some serious coding and lots of fun. This entry was posted in Apple, Collaboration, Community, iPhone, Unconference and tagged Apple, Community, iPhone, Unconference on August 4, 2008 by Alolita Sharma. August 1 Evening: The camp started with more than 300 people attending the opening session on Friday evening to get started. People discussed app ideas, development plans and formed teams. iPhone users ranging from developers to user interface specialists and even photographers joined in to brainstorm. The organizing team (thanks Raven & Dom), volunteers and Adobe staff were exceptionally helpful to participants coming in. A lot of energy and high spirits. 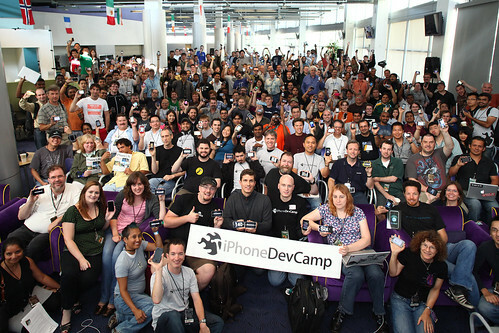 I was impressed with the number of sponsors (60+ sponsors) and supporters for the DevCamp, all interested in encouraging this open community around the iPhone phenomenon. August 2 Morning: It is Saturday morning now and the DevCamp is already buzzing with activity. After breakfast, sponsors were introduced briefly by Raven and Dominic. Right now, the keynote forum with Merlin Mann is in progress. Mann, introduced as a “maker of fun” and iPhone evangelist, talked about the excitement the iPhone has generated and a major itch to scratch according to him has been “email”. Mike Lee of Tapulous and Brian Fling of Leaflets are the other two keynoters. Fling talked about the new version of Safari and leveraging the latest features to build interfaces for the iPhone. When the panel was asked about the some of the killer apps that make the iPhone really worthwhile, they listed Surfline.com, iChat, Twitterific, Games, Safari and Remote. The keynoters also discussed about were killer interactions that make iPhone apps highly usable, user habits (i.e. how do users use the iPhone vs. iPod / iTouch), interactivity of web apps and making UIs friendly and usable on iPhones. Usability suggestions included not having to scroll up and down unnecessarily, having short sequences to perform actions, remove splash screens from apps, not using video on splash screens especially on games. The last part of the forum is Q&A between the participants and keynoters. Interestingly, user interfaces that got flagged by users as needing improvement for iPhone like interfaces included Amazon.com, and some Google services. This entry was posted in Apple, Community, iPhone, Unconference and tagged Apple, Community, iPhone, Unconference on August 2, 2008 by Alolita Sharma.